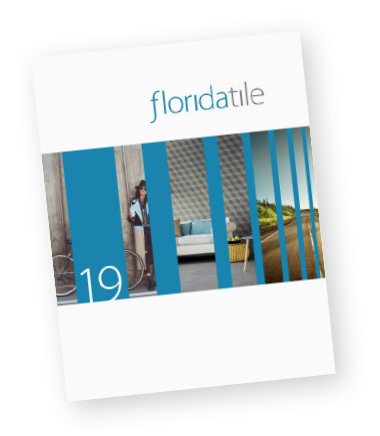 Florida Tile is pleased to announce a revolutionary new porcelain tile concept Thinner; large format thin porcelain tile. Created with the latest technology in technical porcelain production we are able to create a true porcelain tile that is only 3mm thick. Using the finest raw materials in combination with the newest manufacturing techniques, we have effectively created an entirely new product category. This thin tile is incredibly lightweight, durable, flexible, easy to cut and handle, allowing an enormous possibility of installation options, only a fraction of which we have explored. Our unique manufacturing process compresses each tile to greater than 15,000 tons psi. This creates a very dense, strong, thin tile with increased flexibility, and breaking strength. Further, a 0.5mm fiberglass mesh backing is adhered to each panel, providing additional strength and allowing for ease of drilling, cutting and handling. This process allows us to create a single 3.5mm thick panel with a size up to 1m x 3m (39” x 118”). With the large-scale commercial and residential installations in mind, sizes available are 1m x 3m (39” x 118”), 1m x 1m (39” x 39”) and .05m x 1m (19.5” x 39”) all rectified. All Thinner products have been third-party tested at the Tile Council of North America laboratory. 3plus (3.5 mm) and 5plus (5.5 mm) received an extra heavy-duty service rating and are ideal for residential and commercial floor applications with a cement base, interior and exterior wall, countertops, stairs and so much more. In fact, both thicknesses are suitable for tiling over existing tile, backer board, and directly to a concrete base. Please consult the TCNA handbook for correct installation techniques.